Realizing he had to focus on making his life as an entrepreneur a reality, Pulkys quit his job and left NYC. In preparing for a two month backpacking trip to Central America, he was frustrated with the lack of decent tank tops for the hot weather and the high costs for what existed. This adventure sparked a new business idea: selling uniquely designed tank tops online to guys. At first Waves Apparel outsourced their orders to another printer in Toronto but Pulkys was frustrated with the turnaround times, high minimum order numbers and lack of quality. An uncle with previous screen-printing experience convinced him to buy his own equipment and Pulkys started making shirts in his living room and then a friend’s garage until the “factory” outgrew the space. Waves Apparel recently moved into a 2200 ft2 print shop in downtown Toronto and Pulkys has made it into his second home. “It never feels like we’re “going to work” – we’re always happy to be in the studio,” says Pulkys. In addition to their own designs, Waves Apparel also works with all sorts of commercial printing companies, individuals, business, organizations and schools who need screen printing services. Waves Apparel is also focused on giving back to the city that serves as much of its inspiration. This past summer, they partnered with SKETCH Toronto, an organization that provides creative training initiatives for Toronto street-involved, homeless and at-risk youth to pursue their passion. Waves Apparel donates 10% of all proceeds to SKETCH Toronto and hope to have its artists contribute designs for the brand in the future. Pulkys’ original 416 design, which follows the vintage Toronto Blue Jays look, is quite popular among Jays fans. “When the Jays made their playoff push in late 2015, our online sales began to soar. After every victory, I’d look at my inbox with my jaw open seeing orders rush in,” admits Pulkys. 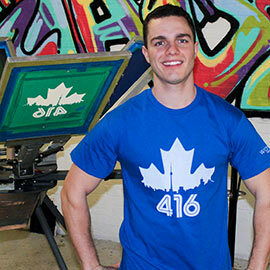 Today, Waves Apparel is the number one recognized brand for the “416” mark. In December 2015, three stores approached Waves Apparel wanting to carry their merchandise, selling out so quickly they ordered more. Pulkys wants to focus on growing these partnerships this year and expects a large rush of sales come MLB season.